Congrats to Jennie R.--ChiIL Mama's family 4 pack ticket winner this week. Enter like we vote in Chi, IL...early and often. We're back again as one of the media sponsors for Beat Kitchen's excellent weekly kindie music series, and we have great free tickets to ALL the kids' shows. We'll have all our November concerts up for entry this week. Wanna get in the Halloween spirit? This week's concert is something special! Mr. Singer & The Sharp Cookies are back with another Halloween Show. ChiIL Mama caught the whole spooky set from their Beat Kitchen show on video last year, and it was one of our all time favs. They played not only their own well loved originals, but a host of rockin' covers that the big kids (AKA: parents) dug just as much as the littles! Check out their live versions of The Cramps' Goo Goo Muck, White Stripes' Little Ghost, Devil Town, Got a Monster in Me, Spider Man and more below. 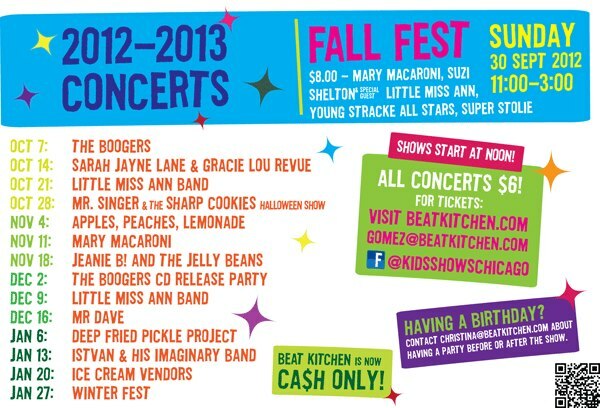 Beat Kitchen's Concerts for Kids are every Sunday at noon, cost just $6, and are all ages. Kids under 2 are free. Show are geared toward birth through 10 year olds with accompanying parents. You can check out loads more great, live Mr. Singer clips on ChiIL Mama's YouTube Channel right here.